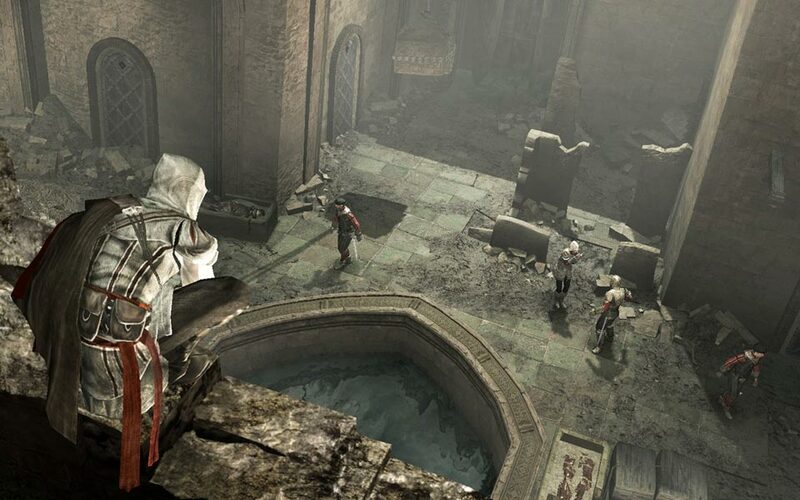 The fourth Assassin's Creed game is the final chapter in the life of Ezio Auditore, seeking to close the story arc started in the second game. Unfortunately for the Revelations (AC:R), it really feels like its primary purpose is to close off those loose ends in the storytelling and to tinker with the edges of the series' formula. I'll be steering clear of any real plot spoilers, so feel free to read to keep reading even if you haven't played it. The premise of this game is that Desmond's brain is going into overload thanks to the countless hours he has been putting into the Animus machine reliving the memories of his ancestors, so he can no longer tell the difference between his own reality and that of Altair and Ezio. This means living out the end of both their tales, as well as coming to terms with his own past. 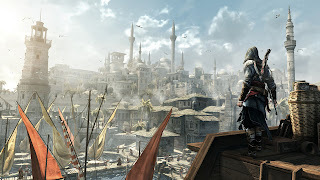 AC:R is set almost exclusively in Constantinople (Istanbul), following the single city plan of its predecessor. While the change in architecture is a definite bonus, Constantinople feels significantly smaller than Rome and there are certain areas that the player where the player must traipse back and forth repeatedly. While some effort has been made to speed up crossing the city with ziplines that allow the player to traverse the rooftops more rapidly, these tend to be in short supply in the areas that are covered a lot. Furthermore, it's quite easy to explore a large amount of Constantinople from very early on in the game, and as such players don't get that sense of gradually exploring and uncovering more locations as time passes. While this supports the open nature of the world, it ends up detracting from the game rather than adding to it. Not being able to go somewhere makes players want it more. Retained from the previous game is the concept of assassin towers and assassin recruits, allowing you to train and call upon assassins whenever you like. The mission system has also received an upgrade, allowing Ezio to manage the assassins to conduct a campaign to regain control of European cities from the templars. This actually makes the missions feel a bit more "real" and make the player feel a little more invested in them by making sure that missions are conducted on a regular basis to ensure a city regained does not fall back into templar hands. Assassins can also go on "master" missions, where Ezio will accompany and assist the recruit to train them, which is a really nice touch. These missions offer a different angle to the gameplay and really let the player take on the role of mentor. Who would have thought teaching could be so much fun? 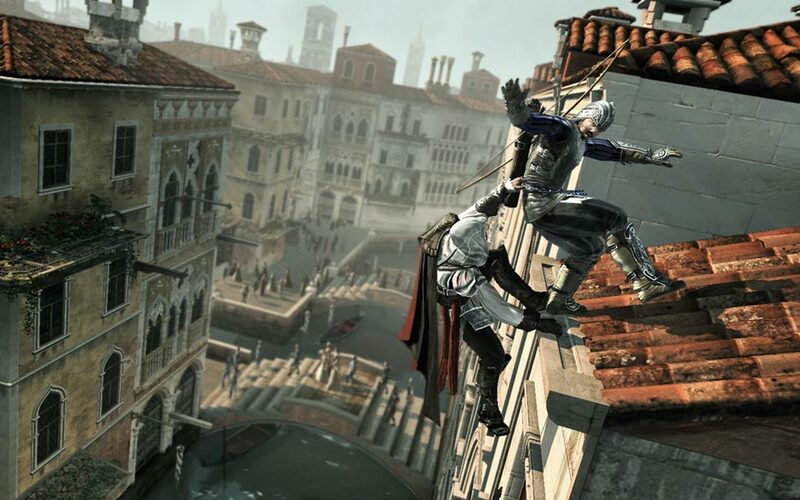 The mechanics and controls have changed again slightly for AC:R, allowing players to more easily wield and use melee and ranged weapons in combat. This is a valuable thing, as the difficult bar of the combat is raised again, and there are some enemies that can really dish out serious damage in a short period of time. While this increased challenge is a good thing, the feedback from the combat feels extraordinarily weak. Sometimes it is possible to lose a large amount of health very quickly without even realising, leaving the player wondering what they did wrong. AC:R also continues to add to Ezio's arsenal, providing even more options for dispatching, disabling or distracting opponents. The ability to easily throw enemies to the ground, use them as mobile free-running obstacles or dispatch them with the countless weapons in your arsenal really gives players the freedom to fight in pretty much whichever style they choose. AC:R does potentially take it to a point where there are too many weapons, so you can end up spending time thinking about your options rather than simply doing. The addition of bombs and bomb crafting adds a new strategic element to missions, but for the most part they really don't seem to be worth the effort and micromanagement required. It's an extra level of fuss over and above the effort of recruiting and training assassins, and that already pulls the player out of the meat of the "real" game enough. Another major new mechanic introduced to the game is that notoriety has been replaced with Templar Awareness. When this meter fills, then crimes can result in templars attacking one of the Assassin Dens, which are the replacement for the Assassin Towers in AC:B. These attacks result in a tower defense minigame where you must place assassins to defend against the onslaught of attacking templars to retain control of your base. Unfortunately it's not a very well designed or particularly interesting tower defense game, and people wanted to play a tower defense game, they'd buy a tower defense game. To change up the gameplay, you get a few sequences where you play as Altair and Desmond, which are a nice touch, but these really seem to come too infrequently to feel like the game is living up to the promise of its advertising, or even the premise of its story. The game is still almost exclusively about Ezio, with Altair and Desmond feeling relegated to minor characters. In the case of Desmond, this is actually a relief, because his gameplay elements are like a first person platform game crossed with tetris. First person platforming is almost always a bad idea, and AC:R is not one of the rare exceptions that makes it fun or enjoyable. The presentation of the game has been stepped up another increment; the cinematics and storytelling elements are arguably stronger than previous games, and the designers have managed to weave in some really visually impressive sequences and places. A giant underground cavern complete with waterfalls is one of the most spectacular settings in the game to date, and given the locales it has covered, that's saying something. Constantinople itself is wonderfully realised, and definite justice is given to the architecture and aesthetic of the city. The music also picks up again, with the addition of Lorne Balfe to co-write Jesper Kyd injecting some new musical ideas into the soundtrack, which really help the feeling of the game after the somewhat lacklustre music of AC:B. Some of the gameplay borders on the fantastically ridiculous, but there are some great missions to be had here. 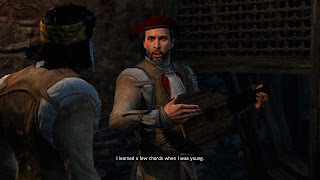 One of the amusing highlights is Ezio taking on the role of one of the much hated minstrels from previous games, complete with self-aware out-of-tune singing, indicating the game doesn't need to take itself too seriously all the time. The only real drawback is the "full synchronisation" requirements of AC:R. If the player does not meet the extra requirements of the mission, then they only achieve 50% synchronisation rather than 100%. This makes the player feel punished for not achieving it, rather than feeling as though they gain a benefit for doing so. There also appear to be no additional memory bonuses granted to the player, which means full synchronisation feels like a chore rather than an avenue for additional fun. 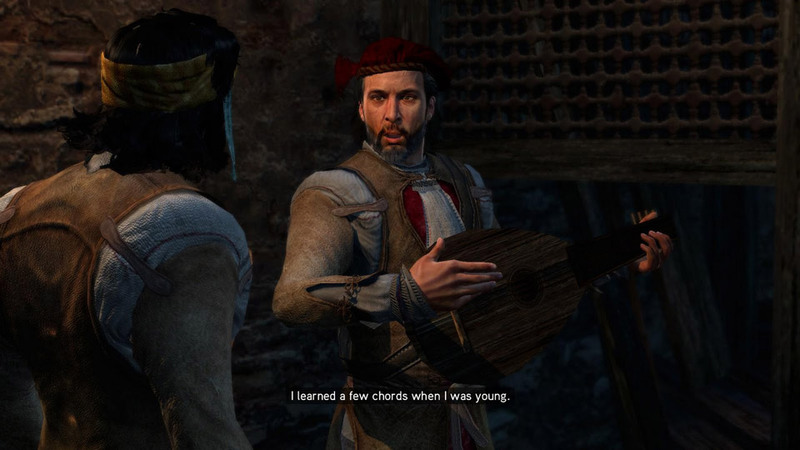 Ezio picked the right career. He's no minstrel. Overall, AC:R is an enjoyable entry in the series, but it's definitely the weakest game except for the first one. It's quite short, experiments with a number of new ideas that don't quite work, but still manages to get the core experience of Assassin's Creed right. The main problem with AC:R is that it doesn't do terribly much new that feels innovative or dramatically better than its predecessors. It's still a lot of fun and delivers more of what players have come to expect, but never really feels like it makes a step forward to really grab the player and whet their appetite for this year's full sequel. If you've been interested in the series at all, it's worth playing, but it's probably not something that would warrant a full-price purchase. 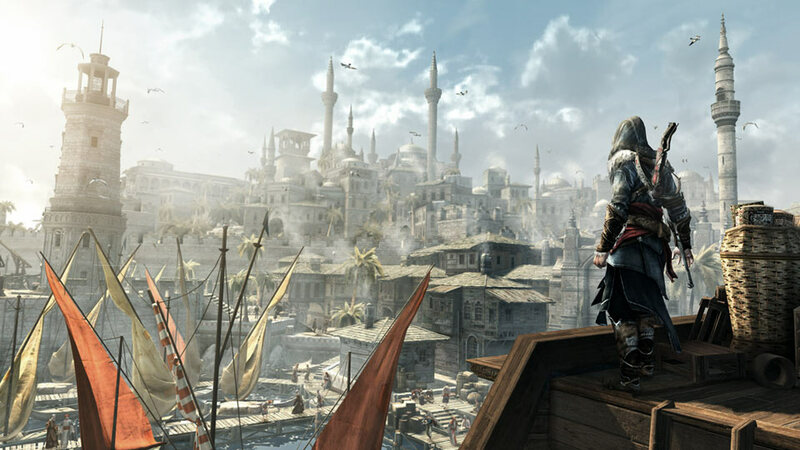 At the very least, it leaves the player satisfied that they've brought the stories of Altair and Ezio to a satisfying conclusion, and it does so in a manner that is fun and interesting to play. I'll be looking at the series as a whole in a couple of upcoming posts, covering gameplay, presentation and storytelling, as these four games offer a really interesting insight and example of how a series can change and adapt while retaining true to its roots. 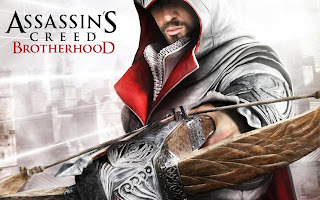 Assassin's Creed: Brotherhood (AC:B) is a seamless transition from AC2, starting immediately after the events of the previous game. 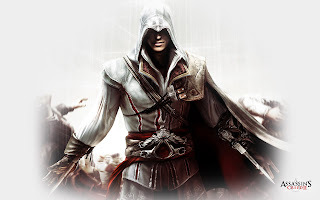 A brief narrated video is all the player gets in terms of an introduction before the game thrusts them into the game proper, back into the role of Ezio Auditore and Desmond Miles. 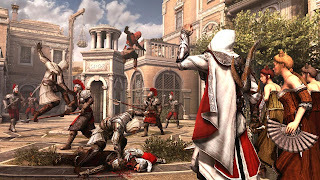 Unlike the previous two games, AC:B is set almost entirely in a single location, the city of Rome. There are a few short segments in alternate locations, but Rome is where the bulk of the gameplay occurs. The introduction is one of these, but unfortunately is one of the weakest part of the game. It doesn't offer much in the way of a meaningful tutorial for new players, but also doesn't really cater to existing players in a terribly interesting or engaging manner. Once this is over, then the player heads to Rome and the player mostly remains here. This turns out to be both a blessing and a curse. 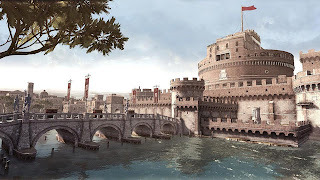 The exploration aspects of the game are significantly reduced as a result of this single location, and there's not quite the same sense of wonder as exploring locations like Jerusalem or Venice. The modelling of landmarks like Castel Sant'Angelo, Roman Forum and the mighty Colosseum is very impressive and detailed, but it doesn't have quite the large scale spectacle of the previous two games. There are also a number of missions and activities that see Ezio covering the same ground repeatedly, so there are certain areas that the player can feel they are seeing too frequently. Conversely, this tighter focus means the player becomes more at home in the setting of game, and is able to recognise and navigate via landmarks much easier. This leads to a welcome familiarity, and provides a sense of growing in knowledge just as Ezio would have gained in his journey to becoming a master assassin. The player can learn routes and quicker means to move about, which can give them an edge when trying to escape from guards or hunt a target. As with previous games, AC:B does briefly remove most of the player's equipment a short way into the game, but even more so than AC2, is very quick to return it again. This is largely a power balance issue, reducing Ezio's health and his better weapons that would allow him to kill enemies with little effort. The good thing is that Ezio's range of equipment is mostly given back fairly swiftly, the main thing players have to wait for is the improved swords, maces and daggers that are faster and more effective against enemies. 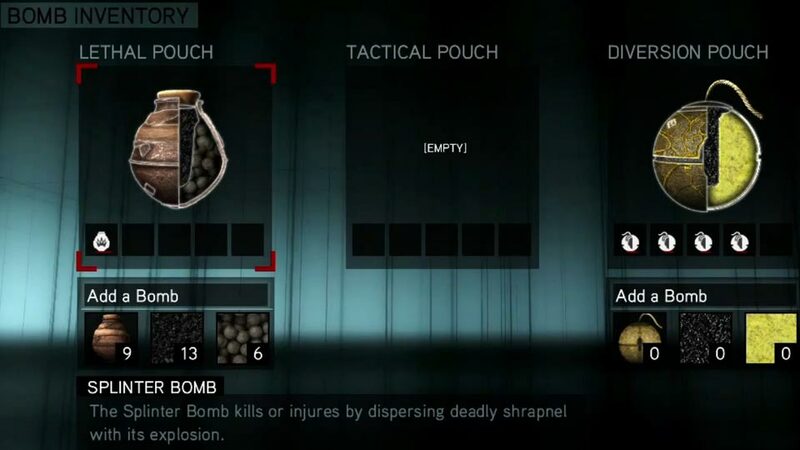 Even better is that the player is given a few extra weapons with which to dispatch enemies. The addition of the crossbow is particularly nice, especially given it was featured as a weapon in the opening/trailer cinematic for the original Assassin's Creed, but had never been available until now. About time we got this! Freedom of movement and the variety of moves available also increases once again in AC:B, as does the difficulty of the enemies. 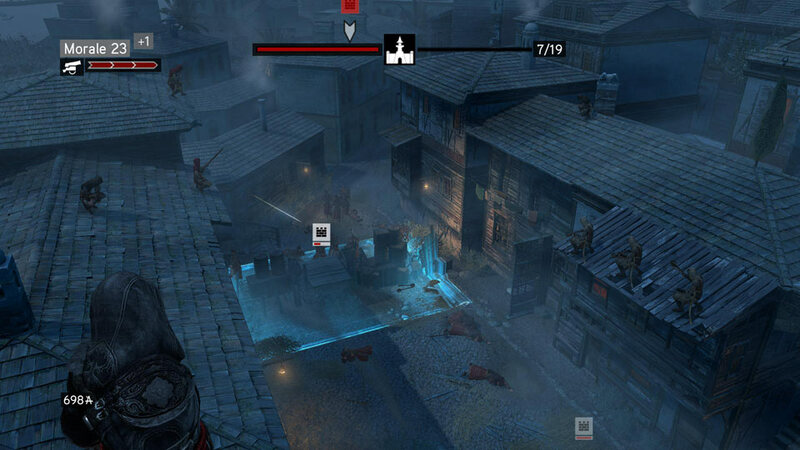 The game requires players to implement a variety of tactics to overcome enemies; a further improvement from AC2 where it was still sometimes possibly to defeat opponents through brute force and/or perseverance. Quick kills and kill streaks pose a new means to end lives, and the ability to leap from horseback to horseback assassinating enemies is somehow far more enjoyable than it has a right to be. These killing abilities come in handy when attempting to kill a fleeing templar captain, which happens when attempting to establish a new assassin tower within Rome. This new gameplay element involves Ezio trying to get close to the target without being spotted, as when Ezio is seen, the captain will attempt to flee to the safety of the templar controlled tower, and Ezio must kill him before he does. Doing allows the player to recruit new assassin allies, which can be summoned to assist during missions to kill targets without Ezio have to dirty his hands or attraction too much attention. These allies can make some missions laughably straightforward, but it's a nice extra assassination tool to have in the player's arsenal. 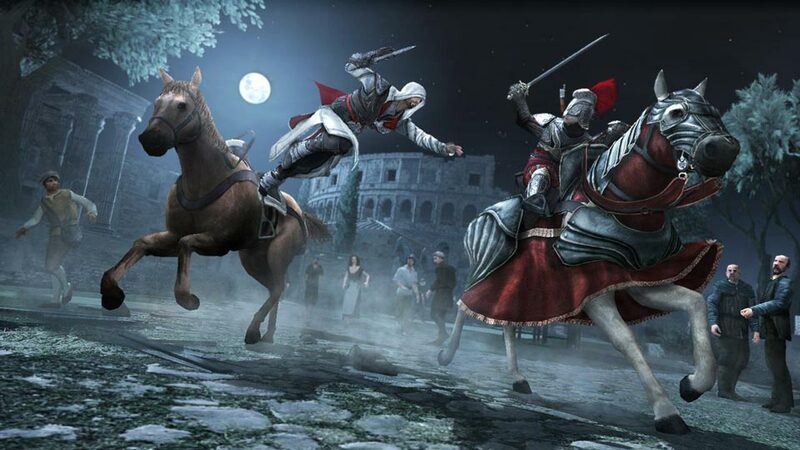 Another highlight is include the addition of "full synchronisation", where extra "memories" (read: missions from Ezio's past relating to a love interest named Cristina Vespucci) become available upon completing a mission while meeting certain additional requirements. These can include: finishing under a time limit, killing enemies in a certain fashion, not being detected, taking a limited amount (or no) damage, among others. This is an excellent way to pose an additional challenge to players without them feeling too penalised if they do not succeed. These bonus missions also serve to flesh out Ezio's character a little more; he really does start to feel like a fully realised character who has evolved from the brash youth of AC2. One area where the game does take an unfortunate step back is mobile blending, again returning to the simplistic "hit A to blend" option to hide withing a moving group of people. The game also starts to fall apart a bit in the tail end with a series of missions that are fairly simplistic and a little bit tedious. The management of numerous assassins by sending them on missions and training them up can also feel a little repetitive and dull, even though they are fun to call on in the middle of missions or just generally roaming about the city. "And then I stole his horse... "
The only other real shortcoming is that it doesn't really feel like it offers much that is terribly new or innovative in long term gameplay. There are a few segments where the gameplay is switched up with Leonardo's war machines, or a few different mechanics, but none of these really offer anything that feels like a huge step forward for the series. It really feels like an extension of AC2 rather than a whole new entry to the series, even though the designers did step up a notch in terms of mechanics and even the storytelling and overall presentation feels more polished. The drawback is that the ending once again feels rushed and the story of Desmond is notably lacking in content and context throughout most of the game. AC:B is very enjoyable game despite feeling like "more of the same" of its predecessor. There are changes and improvements made around the edges, and Ubisoft really seem to have filled out the gameplay and getting sufficient variety into the mechanics and the art of killing to give the player and Ezio a complete and manageable set of tools with which to dispatch his enemies. Stick through the slightly laborious opening to get into the meat of the game, and you'll be glad you did. Picking up from where the last post on Assassin's Creed left off, Assassin's Creed 2 steps in right after the end of the first game. With a brief bit of exposition, the game throws you into the role of Desmond Miles, and you're witness to the birth of the new "protagonist" for the game, one Ezio Auditore. Then you're thrust back into the modern world, and forced to escape the building of your captors. This would likely be a little bit jarring for people new to the series, but it serves as a quick entry point into the series for those who missed the first game. Tossing them into the deep end, but at the same time meaning that they don't actually need to backstory of the first game in order for this one to make sense. It's a not a bad trick, and straddles a nice line between continuity for old players and introduction for newcomers. What it does significantly better than its predecessor is the way that it introduces gameplay elements to the player. 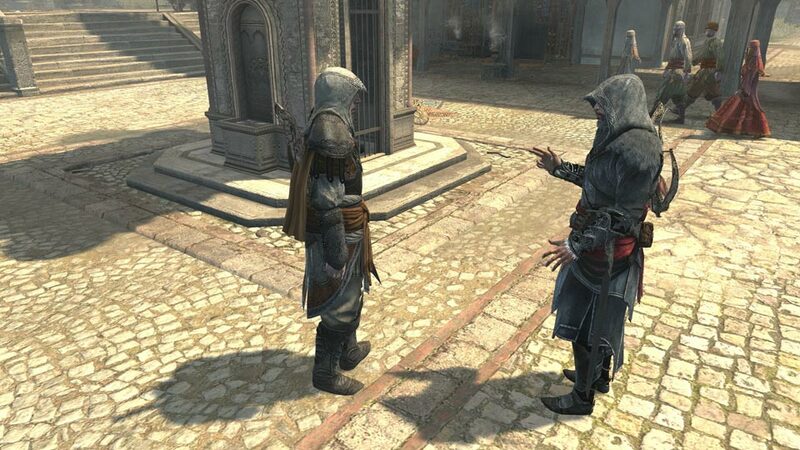 While Assassin's Creed (AC1) made players go through a series of tutorials to learn the mechanics, AC2 integrates those tutorials with the story in order to gradually add to the player's repertoire and push the narrative at the same time. 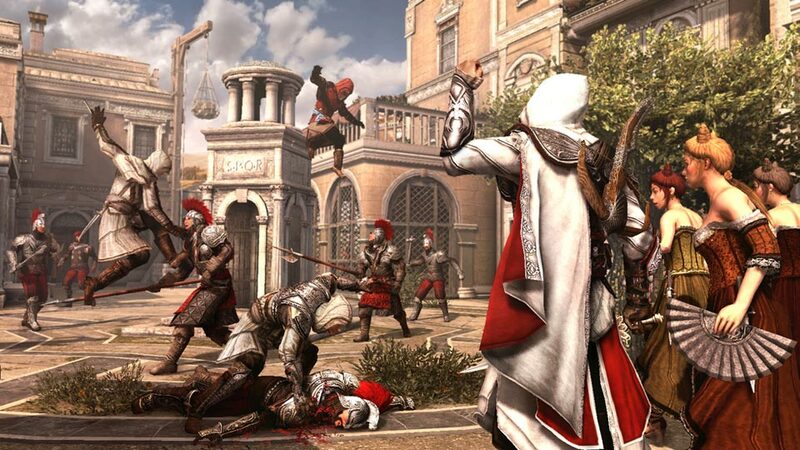 While this could be annoying if the player were forced to run around as a brash youth delivering letters and beating up miscreants, it doesn't take too long before Ezio starts to become a real assassin and get down to the business of stalking and killing his targets. This is where things start to get interesting. The concept of stealth and getting close to a target have been reworked significantly. Whereas previously stealth involved joining a specific group of white robed scholars by pressing a button, the player is now able to actively and organically blend with a group of people by walking into the middle of the group and keeping pace with them. This subtle change makes a huge difference to the flow of the game, and makes the player participate in the act of hiding within a group of people rather than simply pushing a button and watching it happen. It is possible to fall out of step with the group, which can be annoying, but again this actually makes the player feel like they're actively being engaged by the gameplay mechanic rather than simply pushing a button and then waiting. The similar improvements to escaping from guards (which includes making it a more challenging task) make the player feel more like an assassin who is actively working to fly under the radar. The game is also fairly keen to give you new assassination techniques: killing someone from a ledge by leaping on top of them, hanging onto the edge of the building and pulling your unsuspecting prey off, or killing someone from the safety of a hay bale. A second blade to assassinate two people at once is also a welcome addition, especially when combined with the aforementioned leap. These were a massive step forward for the series as well. These really add to the stealth aspects of the game, and are wonderful for those players who love to spend a lot of time doing parkour along rooftops. No longer do you have to get down on the ground and potentially lose the element of surprise, but you simply leap down and kill your target in a single move. The addition of poison and a pistol felt less useful and interesting for the most part, but were a nice touch to have something different at your disposal. Timed race missions are a fairly mundane addition to the gameplay, as the scope for varied paths to succeed are limited, so it's basically just learning the correct route to succeed. Courier missions are much the same. The assassination missions are where things get more interesting, and there is a bit of variance in how these play out, requiring the player to use different skills in order to find, track and kill their target. Timed platforming in the assassin tombs is a distinct lowlight, as are the chase scenes present in these, as catching your prey is a fairly counterintuitive process, and is poorly done to boot. It's impossible to catch a fleeing templar except at a specific point, so even if you're ahead of the game and theoretically have gotten ahead of the person you are chasing, they magically jump forward in the chase sequence to make it "fair". The same applies if you fall a long way behind. The templar will obediently wait for you at the next checkpoint until you figure out the alternate route needed to reach him. It feels cheap, contrived and unnecessary. While some of these side options for gameplay aren't the highlight of fun within the whole experience, when combined with the main missions of the game, they supply a lengthy and varied experience for players. The game isn't just a visual sandbox like AC1, but is a truly flexible and free flowing sandbox where you get to play out many different scenarios, and you can even attempt many of them using different approaches. Want to stalk your target and kill them in secret? Sure. Want to draw your sword and charge in the front gate, killing everyone in your path? Sure, that's allowable in many cases as well. With an increased number of tools and gameplay mechanics at your disposal, AC2 allows freedom in a way that AC1 never managed. Another positive I have to mention are the improvements in the presentation. Gone are the length expositional dying cutscenes. While these were okay in AC1, the fact that they were really the only way to push forward the story made the storytelling a bit forced. Also, the fact that every victim would give you a long winded speech felt somewhat ridiculous. The storytelling is much more frequent and you also get some information delivered through conversations you hear while preparing for an assassination rather than direct exposition to Ezio or the player. The experience feels much more realistic and believable, and as a result is a far more engaging tale. The music also deserves a special mention, as there are some truly excellent tracks from Jesper Kyd that play during the game. The track "Heart" that is featured when the title of the game is finally displayed (which takes a little while) is one of the many standouts. While the ending of the game feels a little bit lacklustre, the journey throughout is superb and provides a great deal of breadth and depth in experiences. It's also quite a long game - you can expect to rack up many hours exploring and completing missions. AC2 delivers on the promise of the first game. 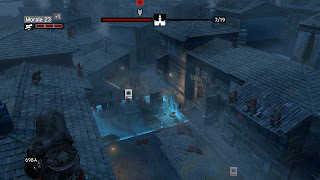 It expands the gameplay and mechanics to let the player not only let the player travel and free run through expansive and wonderfully created cityscapes, but to truly adopt the mantle of a master assassin.